the xray doctor: xrayoftheweek 34: what name is given to this classic sign? xrayoftheweek 34: what name is given to this classic sign? This week's #xrayoftheweek is this reconstruction from a CT of the abdomen and pelvis. What does it show and what name is given to this classic sign? There are several wires running across the abdomen from cardiac monitoring leads. In addition, there are multiple abnormal looking vessels running across the abdominal wall, all appearing to head towards a focus in the upper abdomen (a few centimetres superior to the umbilicus). This includes a pair of vessels running up from the groin, over the rectus abdominis muscles. 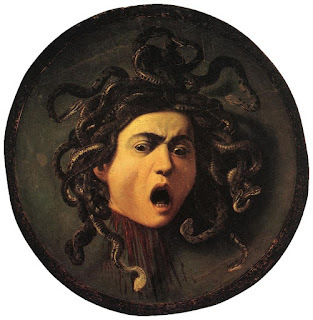 This is the caput medusae sign - named after the mythical Greek monster Medusa. Instead of hair, she had venomous snakes on her head and the appearance of the engorged vessels on the abdominal wall has been likened to the appearance of Medusa's head. This sign can been both clinically and radiologically in two different scenarios: portal hypertension and in systemic venous obstruction, with blood flowing in opposite directions in these scenarios. This was a case of portal hypertension - there is recruitment and recanalisation of paraumbilical veins which head towards the umbilicus from the upper abdomen, where they flow into the superior and inferior epigastric veins, providing a route for portal venous blood to flow into the right heart via the systemic circulation. This pathophysiology is also the mechanism whereby portosystemic collaterals form around the gastoesophageal junction and are a cause of haematemesis and melaena in people with portal hypertension. In cases of systemic venous obstruction, the flow is in the other direction - i.e. the systemic venous blood returns to the right heart via portal venous pathways. The unusual feature in this case is that the main point of communication of these vessels in superior to the umbilicus - I am not sure why this is. The above image shows that from this "varix", there is a vessel heading towards the umbilicus, but smaller in calibre than the other vessels, so the core pathophysiology is still maintained.